So many things change our lives: circumstances, the family we’re born into, where we went to school, what career we chose, what jobs we did, how our parents behaved, what heartaches and heartbreaks we’ve faced, sickness, poverty, wealth. The list is endless but books can change our lives too: sometimes, a deep and powerful impact that changes us forever. Aside from the Bible one of the books I credit for changing my life as is “Beyond Ourselves” by the renowned American author Catherine Marshall. Her inspirational writing has touched the lives of millions and continues to do so even now, although she died in 1983. As a very new Christian, I was thankfully led to read this book when I needed feeding all the time. I was reading the Word but I needed something that related to everyday life and situations. This was where this book had such an impact. I hadn’t read much Christian literature at that time but was so thirsty to know more about this new life I had chosen. I remember feeling like a sponge, just soaking everything in, the good, the bad and the mediocre. I needed to see how you could live your life as a Christian and what it actually meant to face the challenges life threw at you. Probably one of the most profound topics was that of forgiveness. Catherine gave such personal testimony of how she had been enabled to forgive and I was very quickly convicted that I needed to forgive someone who had hurt me very deeply. So strong was this conviction that I didn’t wait long to obey the inner nudges, or shoves. The person I was struggling to forgive had caused me to lose my job and had taken my role on when I left. That event had caused chaos in my life. As a newly single parent unemployment was the last thing I needed. Encouraged by Catherine’s book I came before the Lord and made my peace with Him and released my forgiveness towards this lady. Sometimes God wants to check we’ve done it for real, meant what we said. Only a few weeks later I found myself sitting behind this lady at a seminar. Had I not forgiven her she would probably have withered under the force of my feelings. But the Lord wasn’t done with me; He convicted me again that I should speak to her and apologise for my part in what had gone on. That was hard. I was shaking but knew I couldn’t duck this one. As I spoke to her I could feel the grace and peace of the Lord flood through me and although our paths were unlikely to cross again, I knew I could face her any time. The real blessing was that she apologised too. Light as air and free as a bird at that moment, I left knowing that something very powerful had taken place. The Divine exchange. 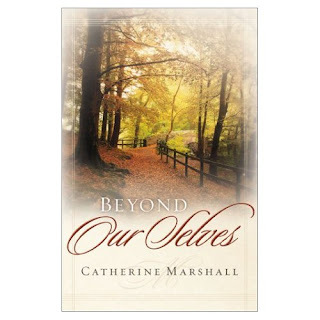 I read as many of Catherine Marshall’s books as I could; they were sustenance and I devoured them all. She was so honest and real about the life situations that she encountered and didn’t shirk away from the tough stuff like suffering and healing. You almost feel like you really know her by the time you finish. So often we’re afraid to be real with each other, wear a mask and smile hoping no one will find out what’s going on inside. But the shallowness brings no relief and until we face up to our truth we cannot know peace, healing, forgiveness and grace. It’s more than twenty years since I first read this book and I was inspired to read it again. Unable to find my copy, which I probably lent to someone else who’d just entered the Kingdom, I have purchased another copy and am savouring it all over again. My life has had many twists and turns over these last twenty four years, some of which I would never have wanted to experience but the simple message and power of encouraging and inspirational writers like Catherine Marshall gave me hope, increased my faith and afforded me the courage to be real about my life. I love the way she never thought too highly of herself, asked the difficult questions of God and praised Him for the answers. Amply demonstrating that nothing is wasted in the divine economy, she found a new purpose after the devastating,untimely death of her husband. She poured out her pain through her pen and allowed the Lord to turn her sorrow into joy, helping us all to realise that there is always hope. I will still happily place this book in the hands of a new believer as a guide and help. I have always aspired to write and offer something meaningful. Catherine’s writing and her journey as a writer were a touchstone for the journals I have kept for more than two decades and the literary journey I am on now. I do wonder what she would have made of blogging. I’m sure she’d have been out there with the others offering her warmth, wisdom and intimate insights of the Lord to the 21st century. Alice’s Bio: I’m a mother of two beautiful daughters and a grandmother to three enchanting grandchildren. I live in one of the most beautiful places in the country, Cornwall. Fortunate enough to live by the sea, I never want to be too far away from its sight and sound. I love music, words, painting, life, my family, my friends and most of all my faith. I live on the same roller coaster as everyone else but love to encourage others, support them when they’re struggling and most of all want to have made a difference to the world by the time I leave it. I believe faith is an intimate part of everyday life and seek to relate the ordinary to the divine. It is the encouragement of others and the amazing love and grace of God that has brought me to this point. I liked her books on Peter, on the Holy Spirit, Beyond Ourselves and its sequel, Something More. I have a selection of her journals too, which I am enjoying. Welcome to my blog, Miss Mollie! Catherine is one of my favorite writers, too. I identified with “Julie” Her book on her husband, Peter, also inspired me. So many of her books helped me when I read them.